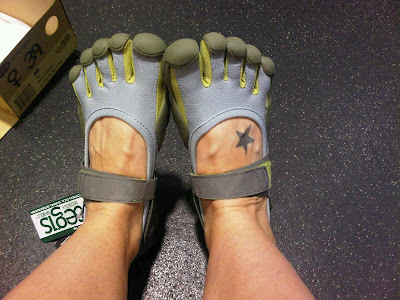 I've been coveting a pair of Vibram FiveFingers for more than a year. I first saw them being worn at Second Home Nature Center and promptly went home to Google "toe shoes." After reading a negative review last fall I put them out of my mind. But this summer they kept cropping up everywhere. I saw a young couple wearing them while grocery shopping (much to the horror of my fiance). I read a blog post written by a woman with serious foot problems (metatarsalgia) who found relief while wearing her VFF. I decided it was time to at least try them on myself. It took four pairs before I found the right fit. The first pair was too tight, so I tried one size up. But that one was way too loose and too long. Disappointed, I left the store, afraid that my feet fell into that in-between size and that I might never be able to own a pair. During the next few days I did some more internet research and found that sizes vary between styles. Knowing that, I decided I should try on a few more pairs before giving up. If there can be variability between styles, there might be some slight variability even within the same style (I had my heart set on the Sprint, pictured above). I'd read lots of cautionary tales on the importance of acclimating your feet/legs/ankles to the minimalist style shoes. Doing too much too fast can risk injury. My first day out I walked my planned 15 minutes. I walked slowly and carefully, concerned about every little pebble or crack in the pavement. But while I could certainly feel the ground beneath my feet, nothing hurt! After my allotted 15 minutes, I stopped home and changed into traditional sneakers to continue my walk. On day 2, I followed a similar pattern except I extended my walk in the VFFs to 20 minutes. I also went "off-road" to walk through the grass around the perimeter of the neighborhood park. This felt better and more natural on my feet than the warm pavement. On day 3 I moved up to 30 minutes without any problems. Today I'm planning to take my VFFs to Second Home Nature Center and try them on the trails there. I expect the wood chips will be more pleasant than pavement. The only sensations of acclimating I've experienced is a feeling of stretching on the underside of my toes between the ball of my foot and the pads of my toes. Speed wise I am definitely moving slower, but I think that's fine initially. I hope I can increase my speed as I become more confident in walking almost barefoot, something I haven't done much of outside the house in several decades. Glad to hear your persistance paid off! Did you find the article in the Sierra Club magazine? I did! Good read, thanks. I have also desired a pair of those for some time, as I hear they make great running shoes. I have always called them "foot gloves" though, and I've never actually gone to check them out. Oh, and I might be back to blogging again, depending on whether I can continue paying for internet access. Either way, I thought I'd go check in on the old commenting crew. I didn't know you were blogging again--I thought I'd subscribed, but I didn't see this! I've been wanting a pair of these also--have read both good and bad about them. Be interested to hear they they are after a while.